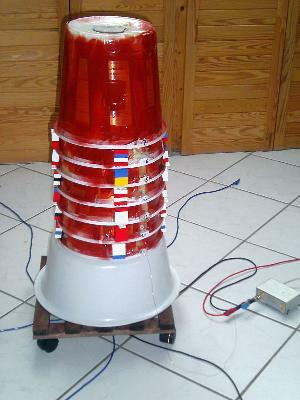 This coil, built and used by Markus Vester DF6NM, is made from seven identical nested bucket coils as shown in the adjacent photo. As you can imagine, the normal mode spectrum of this coil is quite rich and it is a good test of LCnetgen to model it correctly. To achieve good accuracy for several of the lowest resonances requires over 30,000 tiles and needs about 3.5 Gbyte of RAM and a few hours to run using the current version of LCnetgen. This is entirely due to the close proximity of the windings to each other. The mutual capacitance between windings needs to be modelled quite accurately in order to obtain correct predictions of the higher mode frequencies. ; the beginnings of consecutive windings are 50, 53, 50, 53, 50, 50 mm. ;  Something to represent the surroundings. The predicted input admittance at the resonances is always higher in the model, as are the corresponding Q factors. This is because lcng is only using a simple model of AC resistance which takes approximate account of skin depth but does not allow for proximity loss within the windings, which is often quite significant. Also the model assumes lossless surroundings intercepting the external E-field of the coil whereas in reality the return current has to reach the signal generator via a complicated RC network formed from walls, floor. Spice can run a time domain simulation of the coil. A simple shell script can gather the voltage measurements from Spice for each time step and produce animations of the resonances. Below is the voltage distribution of the 517kHz resonance with a 1 volt AC drive into the base.